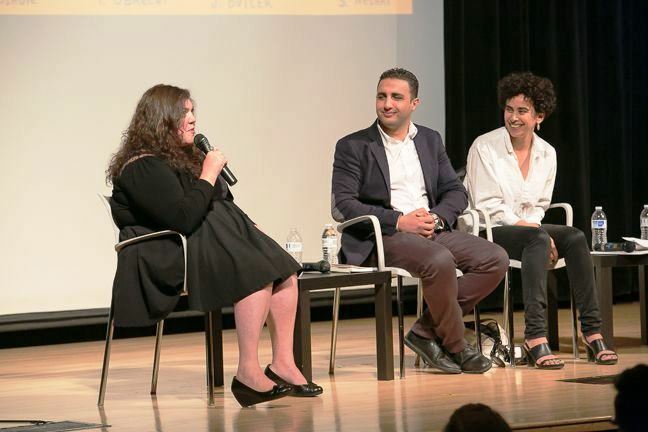 The three-author panel was part of the PEN World Voices Festival, held at the New School’s Tishman Auditorium, and was moderated by Lebanese novelist Elias Khoury. The panel’s title was taken from a novella by Ghassan Kanafani, who was assassinated in 1972, apparently by the Mossad, along with his 14-year old niece. “All That’s Left to You” is considered his most experimental work in form and style. The hall was just about filled, although the prohibitive cost of the tickets — $25 — must have kept away a lot more people who would otherwise have come. Khoury opened the round table by talking about Palestine in the Arab consciousness and modern Arabic literature. He pointed out that he did not particularly like the term “young” as applied to the writers present, as writing is not differentiated by the age of the writers. He brought up the question of Palestine in literature (and in reality) in terms of the concept of “present-absent,” noting that it was Israel that put them in this curious category when it first made the Palestinians shadows in their own country and then transformed this into a reality by denying their very existence. The format of the session began with each writer reading from a text of theirs for six minutes, followed by responses to two questions set by the moderator. Then the floor was opened up to the audience for questions. Palestinian-Egyptian-American novelist Randa Jarrar, the author of the celebrated A Map of Home, read from a short story about Gaza narrated through the eyes of a little girl. Najwan Darwish, who also directs the Palestinian Festival of Literature (PalFest), read 3 poems in Arabic, with simultaneous English translation projected on the screen behind the stage. Adania Shibli introduced herself humorously by saying she hates to read her work aloud, because it is already hard enough to write it without being forced to read it, and that too in a second language. She read out an excerpt from a piece written for an “East-West” dialogue* that she participated in Germany in the wake of 9/11, where a journalist asked if she was afraid, as an Arab woman, of her family “honor-killing” her. Shibli proceeds to analyze who in her family would or would not be up to the task and why. The darkly satirical text was read out in translation by her in a lively way that elicited frequent appreciation and laughter from the audience. 1) In the wake of the Nakba and the abolition of the name of Palestine, which rendered the Palestinians nameless, Palestinian literature has tried to recreate the Palestinian identity (Mahmoud Darwish, Samih al-Qasim, etc). Are you, each of whom comes from a different place, continuing this literary heritage or revolting against it? What is the relationship of your writing to it? Jarrar was the first to answer. She said that she wasn’t really aware of the heritage until she read Emile Habibi’s Pessoptimist, which is like a Palestinian Candide but even better. She identified with its sarcastic, darkly satirical humor, which is how she likes to write. Najwan Darwish said that he doesn’t see himself foremost as a “Palestinian writer,” but as an Arab writer engaged with the tradition and writing of the whole region, and of Arabic literature as a whole. He said he was more influenced by Persian mystical poetry than by Arabic mystical poetry, for example. He identified himself as a committed writer who is involved in the Palestinian struggle, but does not place himself, as many literary critics like to, under the tree that is in front of his house, i.e. Palestine, but also under trees that are more distant. Shibli spoke about her experience with Palestinian literature, which was literally banned inside Israel when she was growing up, outside of one publishing house that distributed Ghassan Kanafani’s work. She talked about the large family in which she grew up, where her father wouldn’t let her read Kanafani till she was 13. Instead, she read the writings of Palestinian educator and litterateur Khalil Sakakini, who wrote between the two world wars, and was enchanted by his diaries and his proposal for an alternative school system, since she hated school as a child and hoped every day that the Palestinian fidā’is would bomb it. It was Sakakini’s diaries which inspired her to write her own diary every day, a habit which she kept up till the age of 21. Kanafani really impressed her as an existential writer along the lines of Sartre. 2) Khoury’s second question was related to the issue of exile and Palestinian literature. He said that when we read good literature, we forget where the writers are from, but recall first and foremost the human condition. However, all Palestinian writers were dragged into the Nakba, which is an ongoing process and they are very much a part of it. He mentioned Israeli medieval historian Amnon Raz Krakotzkin’s text on Jewish memory and exile, where the author says that the Palestinians have inherited the notion of exile from the Jews, and asked the writers how they defined themselves vis-à-vis exile in their writing, and whether they felt exiled at home, wherever that may be for them. Jarrar said that the story she read had grafted the anti-Jewish pogroms of 1905 in Odessa. She related her complicated ancestry, and pointed out that it takes her half an hour to reply when someone asks her where she is from. Ironically, she never felt more Palestinian than when she was detained at Ben Gurion airport by the Israeli authorities and denied entry because her father’s family hailed from the West Bank. Ironically, it was the Israelis who told her most unequivocally that she was Palestinian! Darwish talked about the similarity of the situation in Palestine to apartheid South Africa, to the Native American reservations, and to the systematic discrimination practiced by the Nazis and Italian fascists. He perceptively pointed out that it is Ashkenazi Israel that is exiled from its surroundings; we [the Palestinians] who live there are not exiled, rather it the piece of land that Israel occupies that is exiled. Shibli found the term exile to be problematic, as the Nakba is a constant, ongoing operation. Israel is obsessed with constantly destroying and rebuilding the land it occupies, and changing the landscape to the point of making one wonder if one has a memory of what was there before. She pointed out that neo-liberalism and globalization impose a sort of homogeneity on the whole world that she feels when living outside of Palestine, but inside, there is a feeling of constant change and instability, because of the Israelis’ obsession with constant changing of small details, like uprooting olive trees from farms and replanting them on highways. She feels more exiled inside Palestine than anywhere else in the world. The Q&A was brief due to time constraints, and was devoted more to socio-political issues around the “conflict” and the situation of the Palestinians than it was to literary issues. There was a question relating to the Arab-Jewish literary experience, which parallels to a large extent the Palestinian one, and how the Arab Jews in Israel are often pressured to prove they are “more loyal than the king” by denying their Arab roots and identity. Khoury and Darwish pointed out the presence of Arab-Jewish writers like Shimon Ballas, Sami Michael and Sami Shetrit, who are unquestionably accepted as Arab writers, and how there are some Arab-Jewish writers in the younger generation who have begun to affirm their Arab roots and speak out about the injustice perpetrated on them by Zionism, which cut them off from their place in the Arab world. Shibli spoke depressingly of how Palestinians inside Palestine are more cut off from each other than ever before, and how even facing up to the occupier collectively is becoming more and more difficult, because the mechanization and computerization of the occupation means it tends more and more to avoid any direct contact with the occupied population. Khoury concluded the panel by saying that he was more of a pessoptimist than Shibli, and was sure that Palestinians would invent new ways to continue their struggle — inspired maybe by the tents erected by the villagers of Bil’in in the West Bank on land confiscated for settlements which was named “Bab al-Shams” after his novel — and that their moment of success, especially in literary terms, would come when Palestinians pity their oppressor the same way one pities the oppressed. The discussion was lively and thought-provoking, and well-focused by the moderator. Judith Butler was supposed to have been the original moderator, but she pulled out at the last minute. This was somewhat of a blessing in disguise; there couldn’t have been a better moderator for this panel than Khoury, both given his status as a novelist and given his encyclopedic knowledge of Palestinian literature and history, as well as his masterful direction of the discussion. The time allotted was too brief to allow for more in-depth discussion of literary issues, which tend to be submerged under the immediate political overtones in any event that has to with Palestine and the “conflict.” This was very clear in the abbreviated Q&A, when almost all the questions and comments dealt specifically with the political dimension. It is possible that a longer Q&A, or more time allotted to the panelists for reading their work, and thereby stimulating more views and discussions on their work, as opposed to the politics of their existence and identity, would have been more fruitful and thought-provoking for a panel in a literary festival. Still, the variety in the work read and their eloquent answers to the questions posed by Khoury and the audience made for an enjoyable and lively event that was well worth attending. *Editor’s note: This was trans. Suneela Mubayi and can be read online and The Kenyon Review. Suneela Mubayi is a graduate student in Arabic literature at the Department of Middle Eastern and Islamic Studies at New York University. She counts translation amongst her academic interests. She has translated poems and short stories from young and upcoming Arab writers which have been published in Banipal, Beirut39, Jadaliyya, and elsewhere. Reblogged this on Forward, Sojourner..